What is the typical cost of a newborn session? Newborn sessions start at $450 and include a USB with edited high-resolution images and an online gallery site. Custom albums and print options are available as well. Please contact me for a full pricing sheet. When is the best time for newborn photographs? I recommend documenting your newborn within the first two weeks of life. The younger the baby, the more willing they will be to have us move them around and to different locations. This is the time when they are so snuggly and cuddly and are content just about anywhere. Plus your baby will grow so fast each day and capturing those first few weeks of life is so special. Can we include the rest of the family? Yes, we will figure out a time of day so Mom and Dad and any brothers or sisters can be there for the session. 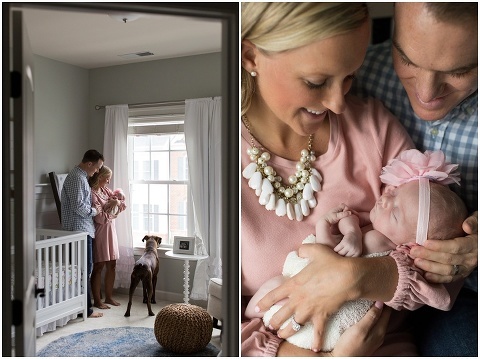 I love documenting those daily interactions between the family and the love they have for the new baby! Give me a call when you are about 30 weeks pregnant and we will pencil in a tenative date. Since the baby’s arrival may fall before or after your due date, we will most likely need to adjust the date. No problem! Just give me a call or email me as soon as you get home and we can adjust this. You will be so busy when you get home so planning this out ahead of time is a plus! Where will we do the session? There are two options, either at your home or on location such as a park/etc. If you choose your home, I can include all of those personal elements into the photographs including the nursery. I will arrive about 10-20 minutes before our session starts so I can take a look around your home for any props and good locations. In addition, I will bring along a few props such as a hammock and blankets. We will do some images without clothing and some with. Pull out any of your favorite outfits and any special blankets, toys, etc. If you are looking for pretty headbands or fun hats, there is so much to choose from on Etsy.com. 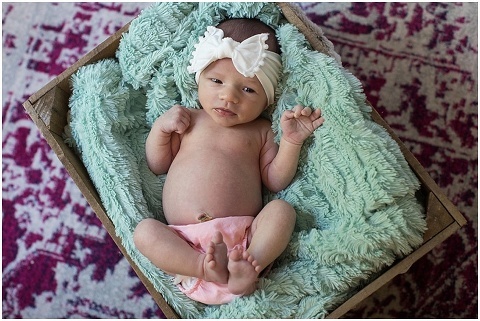 For images with just the newborn in a diaper, cloth always looks great or even a diaper cover such as bloomers. Please crank up the heat in your home before our session. Newborns love to be warm and all bundled up so a warmer than usual home will make those naked baby images more comfortable! If we are using a particular blanket, we can throw it in the dryer for a few minutes. It is a good idea to nurse your newborn right before our session. A full baby is a happy baby! The time of a newborn session will vary wildly depending on the little one from 1 to 2 hours. It is very common that we will need to take breaks for feedings, changings, and an clean-ups.